"The Meathead" (dead from the neck up). religious group not his own, were clear and consistent. ethnic stereotype he had ever heard. small house lived a black family, the Jeffersons. from the white, also provided conflict. became pregnant; the baby, Joey, was born in December 1975.
wife Irene was an accomplished fixer of anything mechanical. and little Joey moved to California and thus left the series. 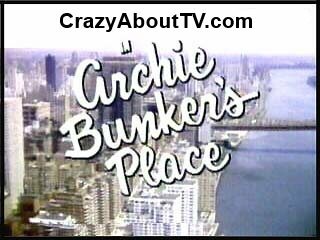 changed to Archie Bunker's Place. in the Family changed the course of television comedy. 187- What'll We Do With Stephanie?